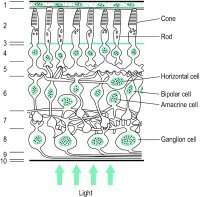 the layer of the retina composed of the cell bodies of bipolar cells, horizontal cells, and some of the cell bodies of amacrine cells. The light-receptive, innermost nervous tunic of the eye. It is a thin transparent membrane (about 125 μm near the ora serrata, 350 μm near the macula and 560 μm near the optic disc). The retina proper has an area of about 266 mm2. It lies between the vitreous body and the choroid, and extends from the optic disc to the ora serrata. Near the posterior pole and temporal to the optic disc is the macula, at the centre of which is the foveola which provides the best visual acuity. The retina contains at least 10 distinct layers, of which there are two synaptic layers. They are from the outermost layer to the innermost: (1) the pigment epithelium; (2) the layer of rods and cones; (3) the external limiting membrane; (4) the outer nuclear layer; (5) the outer molecular (outer plexiform) layer; (6) the inner nuclear layer (which contains the bipolar, amacrine and horizontal cells and nuclei of the fibres of Mueller); (7) the inner molecular (inner plexiform) layer; (8) the ganglion cell layer; (9) the nerve fibre (layer stratum opticum); and (10) the internal limiting membrane. The two synaptic layers where visual signals must synapse as they emerge from the rods and cones on their way to the optic nerve are the two molecular layers (5 and 7) (Fig. R9). The blood supply to the retina is composed of the capillaries from the central retinal artery, which supply the inner two-thirds of the retina up to the outer plexiform layer, and the choriocapillaris, which supplies the outer one-third. There is no retinal circulation in the foveola (avascular zone). A blood-retina barrier is created by the walls of the retinal capillaries which restrict the movement of molecules, which could be damaging to neural tissue or interfere with function, from the inside to the outside of the capillaries. The blood-retina barrier in the outer third of the retina is formed by the tight junctions of the retinal pigment epithelium cells. See astrocytes; optic cup; optic disc; ectoderm; ocular fundus; fibre layer of Henle; macula; neurotransmitter; neurosensory retina; retinitis; retinopathy; rhodopsin; transduction. converse retina See inverted retina. fleck retina Term referring to a retina with multiple, small or yellow spots, which are seen in various conditions: actinic keratopathy, drusen, fundus albipunctatus, fundus flavimaculatus. inverted retina Term referring to the fact that the retina of vertebrates is orientated so that the light has to pass through all the neuronal layers before reaching the photo-receptors. However, the retina of invertebrates is normally orientated so that light passes first through the photoreceptors as it traverses the retina: such a retina is called a verted or converse retina. lattice degeneration of the retina A vitreoretinal degeneration usually found between the equator and the ora serrata leading to a thinning of the retina and characterized by a lesion made up of fine white lines and some pigmentation. It may result in holes or tears and in rhegmatogenous retinal detachment by which time the patient usually complains of floaters. The condition is most common in myopes and often found in patients with Marfan's syndrome. See retinal break; retinal detachment; retinoschisis; Marfan's syndrome. leopard retina See leopard fundus. neurosensory retina This is composed of all the layers of the retina, except the outer pigmented layer (called retinal pigment epithelium). It comprises three main groups of neurons: (1) the photoreceptors, (2) the bipolar cells, and (3) the ganglion cells. In addition, there are other connecting neurons: the horizontal and amacrine cells. The neurosensory layer is derived embryologically from the inner layer of the optic cup whereas the pigmented layer is derived from the outer layer of the optic cup and they are separated by a potential space which facilitates their separation, as occurs in detached retina. Syn. sensory retina. tessellated retina See tessellated fundus. tigroid retina See tessellated fundus. verted retina See inverted retina. *The figures given for the size of the disc are those corresponding to the blind spot. Anatomically the optic disc is slightly smaller.